Cherries provide many different vitamins, nutrients, antioxidants and minerals which are beneficial to the human body. The fruit makes an excellent addition to the daily diet and is important for maintaining overall good health. Cherries are low in sodium, cholesterol and saturated fats, and a good source of dietary fiber and vitamin C. Tart cherries have some of the highest levels of antioxidants, in comparison to other fruits. Cherries also contain more beta carotene, potassium, iron, magnesium and melatonin. According to the University of Michigan, cherries also reduce inflammation and lower the risk factors associated with cardiovascular disease. Cherries have many unique vitamins, minerals, antioxidants and anti-inflammatory compounds which when combined benefit the human body. 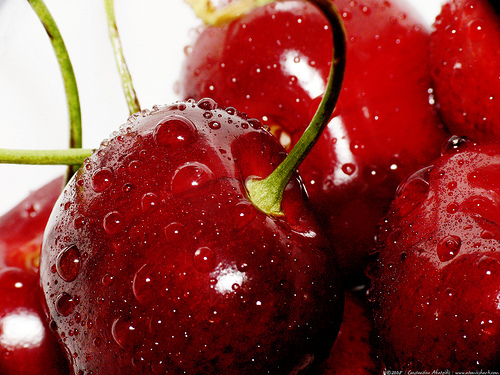 Cherries are good for weight loss and weight management and contain virtually no fat. Vitamin C and E found in cherries may slow the aging process and possibly reverse the symptoms of Alzheimer’s and Parkinson’s. There are also compounds in cherries that can help slow down or inhibit the progression of certain forms of cancer. To preserve all of the healthy vitamins and minerals found in cherries, it is best to serve the fruit in a fresh, raw state. Alternative methods to serve cherries in a healthy manner include adding to yoghurt, sprinkling cereal, in a smoothie, grilling, baking or putting into a sauce for beef, pork, chicken, fish or duck. Antioxidants are found in cherries and clear the body of the damages of free radicals which cause cancer, tissue and cellular damage. Cherries can also provide relief inflammatory conditions such as gout, prostitis, pancreatitis, and allergic conditions like hay fever, eczema, asthma and hives. Tart cherries have been shown to possess anti-inflammatory benefits and athletes who consume cherries or cherry juice after working out reported having less pain. A research study conducted by the University of Michigan suggests that subjects who eat a cherry-rich diet have lower body fat, total weight and cholesterol, all of which are major contributors to heart disease. Another research study suggests that cherries may help relieve the pain associated with arthritis, cherries in the diet help reduce levels of nitric oxide, which is associated with rheumatoid arthritis and osteoarthritis. Cherries are being touted as one of today’s “super fruits,” by many nutrition experts. The fruit is rife with antioxidants are linked with many potential health benefits. Due to the high potassium content found in cherries, it helps control water retention and aids in the treatment of certain autoimmune neurodegenerative conditions and connective tissue diseases. Want to Reduce your menstrual Cramps?